The Nuclear Regulatory Commission heard comments from members of the public. The federal Nuclear Regulatory Commission says Pilgrim Nuclear Power Station has been improving its safety since 2016, but the official reclassification from one of the worst performing plants in the country was held off to make sure the positive changes could be sustained. 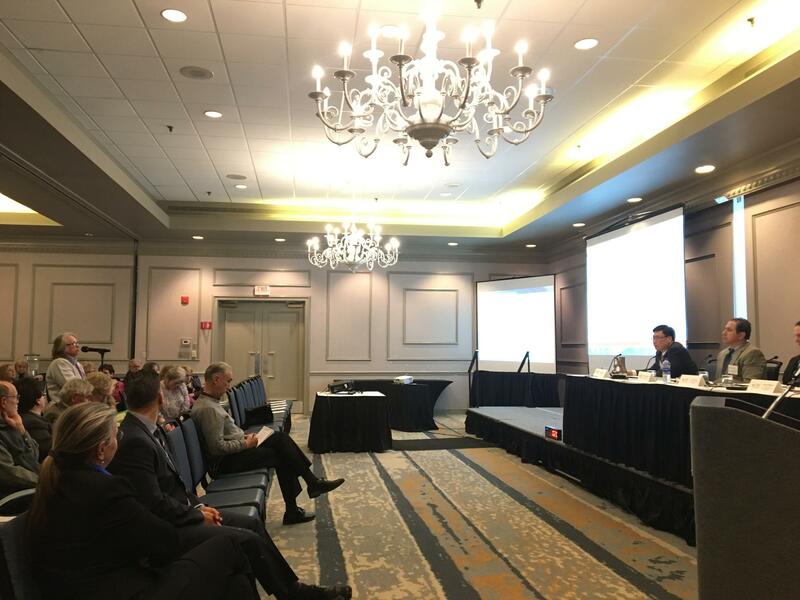 The federal government's Nuclear Regulatory Commission held its last annual assessment of the Pilgrim Nuclear Power Station on Tuesday evening. Engineers from the commission were able to answer questions from the public in greater detail regarding the plant's recent re-designation from a Column 4 plant, requiring the most federal oversight, to a Column 1 plant, which indicates it is now functioning regularly. Members of the public questioned the Commission about the sale of the plant to Holtec, a company looking to decommission the plant, and also about the future plans for storage of the nuclear waste. As was the case during last week's Citizens Advisory Panel, many expressed concern over whether the plant's move into Column 1 was actually well-deserved. Watchdog Jim Lampert of Pilgrim Watch mentioned that he felt the move to Column 1 was worrisome as the plant approaches its official shut down date at the beginning of June. "Looking forward, I'm concerned about inspections. Pilgrim moved from 4 to 1, and they did so because they had a good vice president, and because they had a lot of inspections," Lampert said. "What's going on, once we get to decommissioning, there won't be any resident inspectors anymore, and we all know what happens when you put too much out to self-regulation." Others expressed overall skepticism that the plant could have improved enough to place it back in Column 1. But Entergy employees present said their teams worked hard to change the safety culture at the plant. "The inspection was significant in length. It was five detailed inspections that covered each of the areas that we were found having problems with, and each inspection had a specific team where we had to demonstrate in written documentation that we had corrected the problems," said John Gerety, a safety engineer at Entergy. Others critics, like Pine DuBois, a selectboard member for the town of Plymouth, worried about the still yet undetermined future of the nuclear waste on site, and the land that the plant sits on, on the edge of Cape Cod Bay. The Commission has not yet determined a designated site for nuclear waste, and so for the future the spent nuclear fuel rods will remain in Plymouth. "I would like you to explain the guidance that those inspectors will follow relative to our changing environmental conditions," Du Bois said. "Sea level rising, storms increasing, rains falling harder... where is the NRC in having rapid cleanup of these sites, so they can be successful?" Members of the Commission say they've addressed climate change by mandating that the plant store its spent nuclear waste at a higher point on the site, but note there is still no official off-site storage plan for the fuel. The Pilgrim Nuclear Power Station in Plymouth is one of the worst performing power plants in the country, and it’s scheduled to shut down permanently in June. Pilgrim has been supplying the region with power since 1989. While the plant’s closure is good news to many residents who have concerns about safety at the plant, decommissioning and what happens to the spent fuel presents another host of potential safety concerns. On The Point, we discuss the Pilgrim Nuclear power plant; past, present and future. Pilgrim Nuclear Power Station is nearly 50 years old. It’s moving toward a permanent shutdown in four months, but there are still concerns about safety. When a nuclear power plant closes, it leaves radioactive waste, and a lot of unanswered questions. Pilgrim Nuclear Power Station in Plymouth is one of the worst performing power plants in the country, and it’s scheduled to shut down permanently in four months. Built in the 1970s, it's been continuously supplying the region with power since 1989, but for security reasons, only a few people besides employees have been inside. When Pilgrim Nuclear Power Station closes in May of this year, it will mark a turning point for the town of Plymouth, for nuclear power in the region, and for one woman, who’s been working to shut down Pilgrim for three decades.